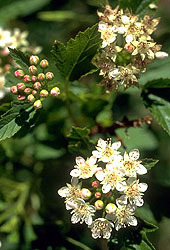 Very hardy and native to cold climates, Ninebark is a shrub finally getting its due from the nursery industry. I can’t think of a design I’ve created in the last two years in which I haven’t include one, or five. 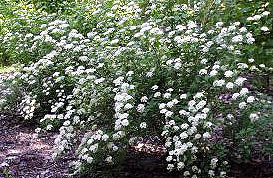 My favorite is Physocarpus opulifolius ‘Diabolo,’ with its rich brown-bronze foliage and umbels of tiny, pinkish-white flowers in early summer. Tops off at eight feet, with a solid six-foot width. All Ninebarks mature to become dense shrubs, good for screening or informal hedges, and are wonderful in naturalized settings. Other good varieties: ‘Dart’s Gold’ gives you a pale-green-to-gold leaf to work with, in a slightly smaller (six-foot high and wide) form. ‘Nanus’ features rich green foliage, and if makes an excellent clipped or informal, mid-sized hedge. Ninebarks need full sun and will do fine in windy, exposed areas. They are not picky about soil type, but as always, will do best in soil that has been lightened with organic matter, though you don’t need to go crazy about it. If the soil drains pretty well, you’re in good shape. “Will it grow in heavy clay?,” I am so frequently asked. Standard answer, of course not. Water once a week after planting, but once you witness healthy new growth, you can down the watering to twice a month in periods of no rain. Once established, Ninebarks prefer it on the dry side, so wait to water until the top two inches of soil under the mulch have dried out. Fertilize once each spring with granular 10-10-10 fertilizer. As is the case with any tree or shrub, mulching with four-inches of shredded bark after plantings is recommended. Hardy to Zone 2 (-50 degrees Fahrenheit).